Worship at High St is at the heart of our community, where everyone is welcome and generally follows a traditional format. More often than not the ages of our congregation can span over 90yrs. With this in mind we aim to make the bible and the act of worship accessible to all, no matter their age, or stage in their journey of faith. Our services are one hour in length, Jesus-focussed, Bible-based and include a blend of traditional hymns and contemporary worship songs. Supported by our organist, music and worship groups our aim is to make our services inclusive and open to all. Utilising music, dance, drama, technology, along with other forms of creative interaction. During the first 20 minutes we meet as a family before the children and young people leave for their groups. This time usually includes a time of praise and thanksgiving and a family talk led by the Minister. For the toddlers, there is a selection of toys, activity packs and creche facilities manned by a team of volunteers. We celebrate Holy Communion on the 3rd Sunday of the month. While we recognise not everyone wishes to receive bread and wine the invitation is open to all. On the 2nd Sunday we hold our monthly All Age service. Led by the music and worship groups Junior Church and FURY are joined by the Brigades for a livelier service. A time of fellowship, including tea and coffee, follows our service from approximately 11.45-12.15pm. 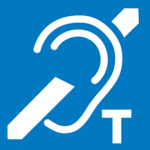 An induction loop is used to support the hard of hearing.